A fantastic fairy myth-debunking series from Go Girl author Meredith Badger. 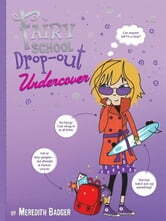 Every time Elly goes to a new fairy school, it ends in disaster, but this week, Elly is going undercover at her friend Jess’s South Street School. Human school "should "be a piece of cake. No spells. No flying. Just normal human stuff. But Elly’s fairy blunders make her feel like she’s been living under a toadstool. Plus, there’s something fishy going on. All the girls are into fairies, and Elly smells magic. Is she really the only fairy at South Street School?